When those 500 much sought after permits are sold, often many months in advance, then that’s it. They are gone. But don’t despair – our alternatives are all great treks in their own right and are in fact preferred by many to avoid the hordes on the well-trodden paths. We suggest you acclimatise for a minimum of 3 days and 3 nights in Cusco before starting any of these treks, because of the high altitudes involved. Our Huchuy Qosqo, Lares, Salkantay and the Moon Temple trek all take you through the heart of the high Andes and include a guided visit to Machu Picchu. Alternatively choose to hike the remote Ausangate trek that takes you well off the beaten track and can still be combined with a visit to Machu Picchu before or after the trek. The Lares trek goes through a traditional weaving & farming area close to the Sacred Valley. You will see people dressed in authentic highland Peruvian clothing, farmers at work, herds of llamas etc. You also have the opportunity to bathe in some hot springs. For a more upmarket In Style Lares trek, please see our Lodge to Lodge trek. The Salkantay option is a bit more rugged and tougher, with higher passes. Starting off at 3,600ms this trek goes up to 4,600ms and then drops down into the high jungle before coming in the back door to Machu Picchu. A stunning high-mountain walk with great views of the big snow-capped peaks in the area and ending at Machu Picchu. Or for a more upmarket In Style Salkantay trek, please see our Lodge to Lodge trek. This trekking adventure features a spectacular 5-day walk around Mount Ausangate in the remote and stunning Vilcanota Range. Fully supported, this trek features hot-springs, stunning mountain scenery and turquoise lakes – making it one of Peru’s finest hiking circuits. You should be fully acclimatised before starting to walk as we will be camping in Altiplano well over 4,000m and crossing several passes at around 5,000m. Or our Lodge to Lodge Ausangate trek. This Moon Temple trek is a great alternative to the Inca Trail, taking in some remote Inca ruins and many stunning mountain views on the way to Machu Picchu. This trek is truly off the beaten track. 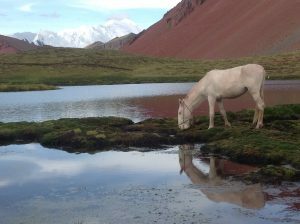 For anyone wishing to get away from other trekkers and to experience the beauty and rich culture of the Andes this is a perfect option. Huchuy Qosqo is a fantastically varied and short trek with Inca Trails and archaeological sites en route to Peru’s jewel, Machu Picchu. It is perfect for those seeking an alternative and interesting trek to Machu Picchu, but who don’t want to hike the longer trekking routes. If you’d like some more information about other alternative treks, itineraries, accommodation or tailor made options, as well as pricing information and the best time to go, please get in touch and we’ll be happy to help. The trek was an absolute success! We reached new heights - both physically and personally - and had an amazing time. 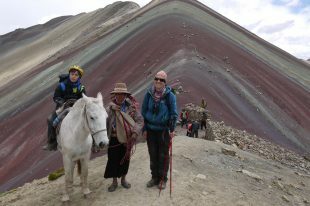 We have both done a fair amount of recommending Andean Trails and the Lares Trek. The trek was truly a one of a kind experience that not only will we excitedly discuss, but also rank as one of the best travel experiences we´ve had thus far. A huge shout-out to our guide Smitty, and the fantastic crew for the amazing meals, setup, and help! Thanks so much for all of your help with getting the trek booked. We truly appreciate it and had the best time, and it wouldn´t have been possible without you! Thanks again! We had an absolutely amazing time in Peru - an experience we will never forget so a very big thank you to Andean Trails for organising things so expertly. The highlight for us undoubtedly was the Ausangate trek. The views and wilderness were second to none but for us perhaps what made it so special was the guide, Ruben, the crew and the two girls who were also on the trip, Sylvia and Anna. Thank you so much for everything.